As Iraq splits apart, we see Tony Blair shrilly insisting that it was not caused by the 2003 invasion, contrary to what a lot of other people see as common sense. In my last piece, I had a look at Blair’s chart to try and explain this departure from reality. George W Bush, by contrast, does not seem to have said anything about Iraq as it is splitting up. A few months ago he revealed his paintings to the world. He isn’t brilliant, but who is? 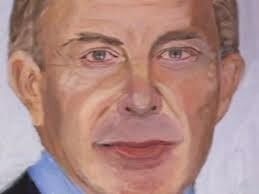 He has done a painting of Blair that is recognisable. He has done one of Putin in 2 halves, one of the face he shows to the world (which may just be a photo), and the other half of the man behind the mask. Bush said that when he met this closed book of a man, he could sense his soul. Much of Bush's diplomacy was based on building personal connections, and he now seems to be turning this ability to connect into paintings. In a way, he is reflecting on and digesting his experience. We don't know what this sensitive man feels now about Iraq. And it is in such contrast to Tony Blair. While he was President, a lot of people seemed to feel that Bush wasn’t leading his own life, that he was following in his Dad’s footsteps and was swayed too much by the old men from his father’s administration that he surrounded himself with. His chart is not a very public one. I can see ‘leader’ in Blair’s chart quite easily, but not so in Bush’s. I can see a power of expression through the Mercury-Pluto Rising in Leo, but I would see that more in an artistic context: the feelingful and imaginative 12th House Sun in Cancer square to Neptune, and the aesthetic Moon-Jupiter in Libra. I see what he is doing now as so much more in accord with who he is. His Sun is not very strong in a worldly, assertive sense, being both in the 12th House and square to Neptune and people-pleasing Moon in Libra. I’d say that caused a ‘loss’ of his identity earlier in his life (the alcoholism would have been part of that) and a vulnerability to the expectations of being the eldest scion of a wealthy political dynasty. He would have to both make money and succeed politically, and he did both in a cack-handed sort of way, through family connections. But it was never him. That is why he has disappeared. He wouldn’t even help the Republican campaign at the last Presidential election. I think it’s an extraordinary psychological story, which may one day come out. By transit, the news of his painting exhibition came out on 4th April 2014, while Pluto was starting to station 14 minutes away from an exact opposition to Bush’s Sun: such powerful astrology says that the painting is not just the hobby of a bored ex-President, but part of a process of a profound change in which a more real person is emerging. This process will continue as Pluto goes on to square his Moon and MC in the coming years. He may even become a good painter, because the artistic element is so strong in his chart. Bush also has natal Uranus conjunct North Node (as has Barack Obama). So he needs to break the mould if he is to feel fulfilled. The mould, I'd say, of his family background (Cancerians are very sensitive to family expectations.) Again, his re-invention of himself as an artist could be his means of doing this. But in a public person, the 12th House Sun will also want to hide, being far more comfortable in quiet solitude and contemplation. You are not likely to get a leader that you feel you know. And I think this applied to all 3 of Bush, Blair and Brown. With Bush, as I said, there was always the feeling that he was living out someone else’s expectations. 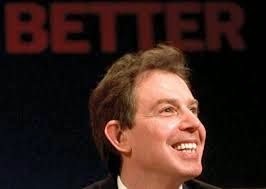 With Blair (whose paternal grandparents were both actors, and who married into an acting family), there was a wall of rhetoric with enormous public appeal that won him 2 landslide elections. But who was the man, what did he really stand for? None of us really knew who this arch people-pleaser was. Until enantiodroma occurred, the phenomenon of turning from one psychological extreme to another. When the prospect of war with Iraq came about in 2002, he quickly turned from cautious people-pleaser into doing what he believed in, with religion as a back-up, regardless of what others thought. And with a big dose of 12th House self-deception thrown in. Bush and Blair both had a persona they could project, while Gordon Brown did not even have that. Prime Minister for 3 unhappy years, he began his premiership with a telling image, speaking from a podium with half his face hidden behind a recorder. 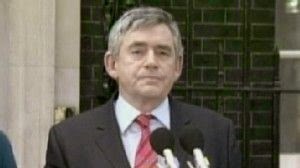 Most of Brown’s personal planets are in the 12th House, but he also has Moon in Leo in the 4th conjunct Pluto: that is the hunger for power that was always snapping at Blair’s heels, even though his personality was unsuited to leadership. Lacking, like Bush, planets at the top of the chart, he has gone happily into anonymity since losing office. 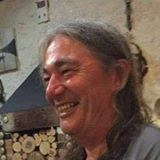 Thanks for sharing your powerful command of the wisdom and understanding of the tools of astrology. I too have "supported" Bush in his withdrawal into his heart-I bless him and have realized that we will in time understand what really went on during his presidency. I see his chart as representing his karmic duties to the collective. The 11th house N Node is powerful and somehow demanded his activity in the world as a leader. 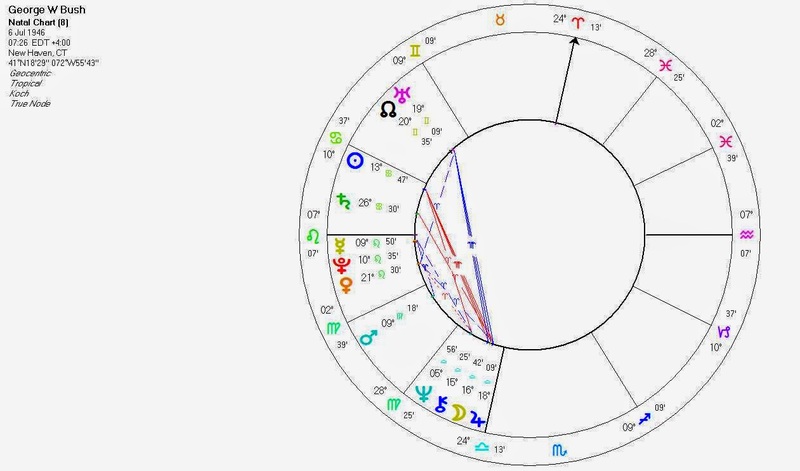 Through your analysis of his chart I not only bless him but also bless myself in my earlier willingness to see my former "enemy" as human and as entitled to my conscious recognition of his humanity as any leader is but I could not see that until he withdrew and started painting your astrological analysis of his chart explains why I could not see him until he retreated. When he does come out and engages his words are truthful and powerful. I see this as his spiritual realization of the spiritual demands of that N Node in the 11th. He may present the truth through paintings yes but I have heard amazing words from him that he lets go in a relaxed almost dreamy way. I found this a very full and compassionate understanding of the workings of power and the collective. I didn't know that about Bush, or his paintings, but can see his own mirror in the painting of Putin; his painting of Blair gives nothing away - probably because he ( Blair) needed to disappear from himself or had to face the truth of the consequences of his decisions. His character is that of the bigamist or glamour of the acting profession - its amazing how elements of the psyche fail to recognise or speak to each other. Having a 12th house sun myself, I really began to understand the complexities of this placement from your analysis - and all the strategies and self and other deceptions that come with it. 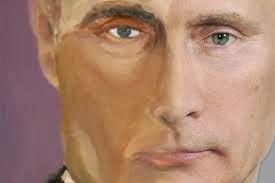 The painting of Putin is extremely revealing. On the painting's right side, it's a perfect rendering of Putin, the face he shows to the world. On the left side, it's the part that Putin hides from us, the 'dark side', the secretive part of his soul. The dead Iraqi child is an expression of inner guilt. He'll probably carry that with him for a while until he's dealt with it and put it where it belongs: as part of his past, which can't be changed but can be understood better by him. And Bush is self-taught, which makes this even better. There is no perfection in any of these pieces, just instinct and an inner knowing. These are more powerful than I had imagined. The simple fact that he is no longer driven by having to please others has taken the shackles off of him. I wish him well. This is a correction: I found the actual painting of Putin. The image in this post is a Photoshop job, joining one of Bush's paintings to a photograph of Putin. I will add, however, that Bush's rather coarse brushstrokes and nearly childlike renderings of his human subjects, with details heavily emphasized, are right on the border between expressionism, which is driven by emotions, and outsider art, which is how children perceive and render the world and people around them. The very flat image of the Iraqi ghost child, rendered in black and white only like an old Polaroid print is a memory, if you will, that will fade with time.